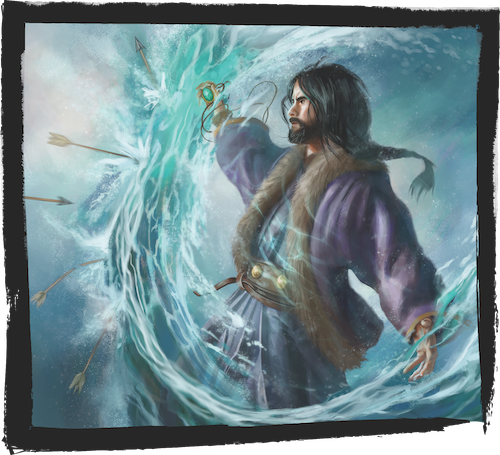 The Kiku Matsuri approaches, and so too does the first story choice for Legend of the Five Rings: The Card Game players! Following the debut event for the game at Gen Con, those competitors who win all five rounds will gain the title of Hatamoto. These elite players will discuss and then cast their vote on the future of Rokugan. As last week’s short story about the Unicorn Clan reveals, the descendants of the Ki-Rin clan find themselves adapting to the traditions and realities of Rokugan while striving to hold true to their heritage and strengths. Of all the knowledge that the Unicorn Clan brought back from their exploration of the Burning Sands, none offends the shugenja of Rokugan more than the name magic of meishōdō. When Shinjo-no-Kami and her followers ventured past the borders of the Emerald Empire, her head priest’s prayers to the Fortunes went unanswered. To survive in other lands, this priest learned magic from sorcerers to replace the Fortunes’ blessings. Drawing on the power of the true names of things, this mysterious practice provides an advantage to the Unicorn’s shugenja in the form of talismans, the creation of which the other Great Clans know little about. And now, the Phoenix Clan believes they have foreseen a great and powerful danger in the use of meishōdō. Their warning will reach the Emperor himself, who will confer with his wisest counselors to determine whether this magic serves the Empire or endangers Rokugan. Click here (pdf, 1.5 MB) to download the short story Smokeless Fire, which leads to this important decision. If the Emperor wills it, meishōdō will be outlawed, resulting in repercussions for not only the Unicorn, but also each clan who allies or clashes with them. Or, the Emperor may judge that this mysterious power deserves further investigation and understanding, and require the Unicorn to share their secrets in service of the Empire. The Emperor seeks counsel, and the Hatamotos will help to guide His Majesty’s decision. This is the first story choice presented to players, and it will be made as a group by those who gain this title at the Kiku Matsuri on Thursday at Gen Con. They will gather to discuss this difficult decision, and each cast a vote. If the vote has an even count on each side, the side with more clan diversity among its votes will prevail. If still tied, the Emperor will look to his most valued advisors, the Scorpion. And if the Scorpion Clan counselors are still unable to sway him to either side, he will trust in the advice of the Phoenix Clan, who brought this petition to his attention. Select a Keeper or Seeker role. Choose five province cards, using one of each ring (or up to two of one ring if using a Seeker role). Choose 30 Dynasty cards for your Dynasty Deck. Dynasty cards have the light card back featuring the 5 elemental symbols. Choose 30 Conflict cards for your Conflict Deck. Conflict cards have the dark card back featuring the 5 elemental symbols. You may use cards from your clan and neutral cards. You may also include cards from one other clan in your Conflict Deck with a maximum of 10 influence symbols (or 13 if using a Keeper role). Cards from other clans without any influence symbols cannot be included in your decks. Kiku Matsuri and Honored Preview Event participants will receive a Core Set and time to build their deck, but competitors in other events at Gen Con should arrive with their own Core Set and prepared deck. Follow the guidelines above or select one of the Suggested Starting Deck Lists to ensure you are battle ready! Following the vote of the Hatamotos on Thursday night, the short story which results from their decision will be available on our website on Friday, August 18th. Keep your sword at the ready for exciting news, including the last preview of cards and starting deck list for the Scorpion Clan, leading up to the Kiku Matsuri!